Andrew Tulloch, Aintree's Clerk of the Course, discussed the ground and the day's sport after racing on day one of the 2019 Randox Health Grand National Festival. He said: "It's been great. We started on really nice ground; the forecast wasn't quite right and we got spiralling showers which then rotated round us all day. But the ground has held up really well. It's proper soft ground at the moment, but that, hopefully, should be nearly the last of the rain. There may be a few showers around but it should be a lot drier for the rest of the meeting. "That means the going will be on the easier side, certainly through tomorrow, and we'll just have to wait to see what Saturday brings for Randox Health Grand National day - we'll have to see how much it dries out tomorrow. "We're on to fresh ground [tomorrow]. All the rail will be moved in tonight; a good four yards on all the bends." Asked to nominate a personal highlight of the day, Tulloch replied: "Everyone has ridden really well and really sensibly today, and the amateurs in particular. It's a big responsibility riding over the Grand National fences, and it was a joy to watch the horses in the Randox Health Foxhunters' jumping those big fences and their jockeys riding so sensibly. "Credit to everyone in the sport, amateurs and professionals, for demonstrating the care and attention that goes into it all, which, in the conditions, is very heart-warming." 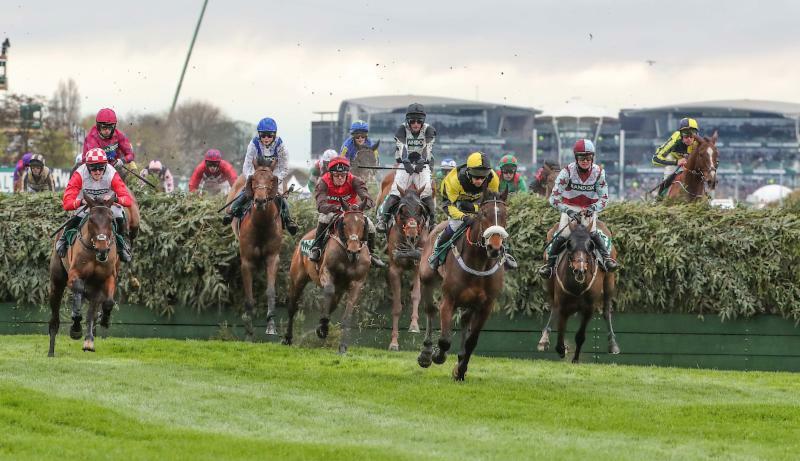 "HIGH-QUALITY ACTION" ON DAY ONE AT AINTREE"
Dickon White, Regional Director for Jockey Club Racecourses North West, reflected on a thrilling first day of action at the 2019 Randox Health Grand National Festival. White said: "Despite the unfavourable weather conditions, it's been an incredible day's racing, probably highlighted by the incredible ride Tabitha Worsley gave the winner of the Foxhunters', Top Wood. "The Foxhunters was an incredible race to watch with fantastic horsemanship under difficult conditions out there. "It was ladies day all over again really with Amy Murphy landing her first G1 win with Kalashnikov which was a great story and Rachael Blackmore winning on Moon Over Germany. "From our perspective, it was great to see such high-quality action. The weather was not overly kind to us, but we'll live to fight another day. "It's great to see that horses who ran at Cheltenham have come to run at Aintree and performed really well with Pentland Hills obviously winning the Triumph Hurdle at Cheltenham and now the Doom Bar Anniversary 4-Y-O Hurdle here, whilst Top Wood won the Foxhunters' and ran well at Cheltenham. "It's obviously ideal to have the four-week gap between Cheltenham and Aintree, but the three-week gap we've had still shows that it can be done. "Friday's racing looks another incredible card with plenty of runners and I'm sure the Liverpudlians will come and enjoy another great spectacle on Ladies Day. "The final field for the Randox Health Grand National has been revealed and it looks another top-quality renewal. "There is the Tiger Roll story, the Trevor Hemmings story and plenty more exciting tales to tell. "It is also interesting that James Moffatt's horse Just A Par will now run for a trainer who has been such a great supporter for Aintree and owner Mark Scott, who runs a taxi company in Liverpool. It will be great to see them have a runner with Just A Par. "There is always a story around the Grand National and this year's looks to be as exciting as ever." Randox Health Grand National runners Don Poli and Outlander were sold at this evening's Goffs Aintree Sale. 10-year-old Don Poli, a multiple G1 winner, was sold to North Yorkshire-based trainer Philip Kirby for £170,000. Kirby was due to run Blaklion in the £1-million Randox Health Grand National before the recently-purchased horse was ruled out of the race through injury. Blaklion was owned by Darren Yates and Don Poli will run for the same owner on Saturday. The underbidder on Don Poli was Tom Malone for Paul Nicholls. Kirby said: "Obviously, we bought Blaklion to run for Darren in the Grand National. He wanted a runner and fair play to him, he has stumped up the money to have another runner in the race. I think the ground will be in his favour as he appreciates soft ground, so hopefully he runs well. "It's nice to have good owners who believe in us and are willing to pay significant sums of money for these horses. He will be transferred into our name and run for us in the Grand National." Fellow G1 scorer Outlander was purchased for £165,000 on behalf of Phil Cunningham's Rebel Racing by J D Moore. He will run in Richard Spencer's name. Moore, a bloodstock agent, said: "Outlander will run on Saturday in trainer Richard Spencer's name on behalf of Rebel Racing. "It is a once in a lifetime opportunity to run in the race. A lot of people spend a lot of money on horses and never get to run in the Grand National. "Outlander could run in the French Gold Cup at Auteuil after this race and could also run at the Cheltenham Festival in the Cross Country Chase next year. "The Rebel Racing lads are delighted to have a runner in the race and we're looking forward to it." Both horses change trainers and will now run in their new owners' respective colours. The two horses were previously owned by Gigginstown House Stud and trained by Gordon Elliott, who now has 11 2019 Randox Health Grand National runners rather than 13. Mr Patrick Mullins was suspended for two days, on dates to be notified to him by the Head Office of the British Horseracing Authority, for failing to obey the Stewards' instruction to attend a pre-race Jockeys' briefing.